What to Do When the Program Prompts the Registration info is invalid? What will you do if you receive the following invalid registration info prompts during the registration? In this case, you can try to solve the problem by following the methods below. The first thing you need to do is to check if the software you downloaded and purchased is correct. To ensure that, please check the full name and version (Windows or Mac versoion) of the software. - If you find that you have downloaded a wrong software, please find the correct one from the the download center. - For those who have purchased a wrong software, please contact us via the email: support@mobikin.com. The registration info contains two parts: license email (the email address you filled in while placing the order) and license code (registration code/regcode). And to ensure the success of the registration, you need to type in both registration info correctly. Tips: To ensure the accuracy, please copy and paste the license email and license code from "Your order confirmation" email or payment platform, leaving no blank before or after it. - The screenshot of the failed registration. Notice: The license email and license code are required during the registration. 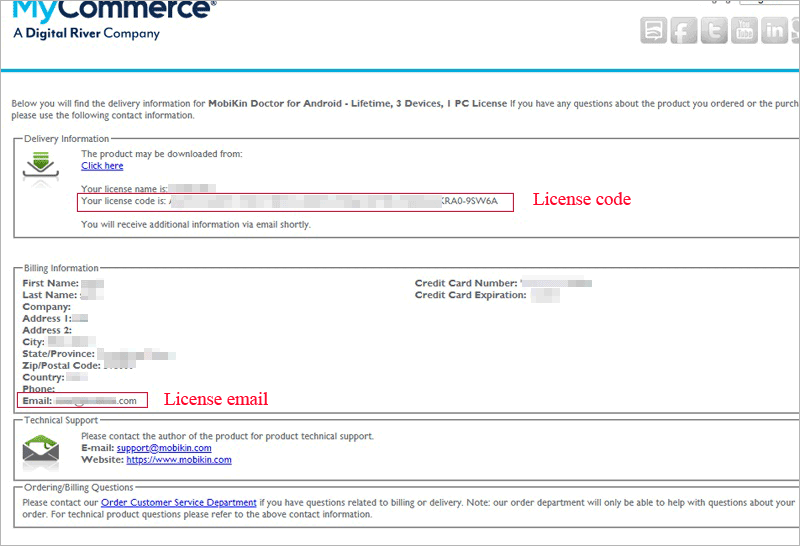 (Here, the license email is the email address you used to purchase the software.) And to ensure the accuracy, please copy and paste the license email and license code from "Your order confirmation" email or payment platform, leaving no blank before or after it. 1. How to Register the Software for Windows? - Then you will see an interface as below. That means the registration is successful. 2. How to Register the Software for Mac? - After that, you will receive the following interface, which means you have registered the software successfully. I Lost My License Code, What Can I Do? - Go to the "Order Search" page of the payment platform to look up your license code. - The date and amount of the charge. What to Do if I Didn't Receive the License Code after Purchase? 1) Get the license code on the "Order Complete" page when you complete the order. - Find out and click on the product that you want to check and then the license code will be displayed. 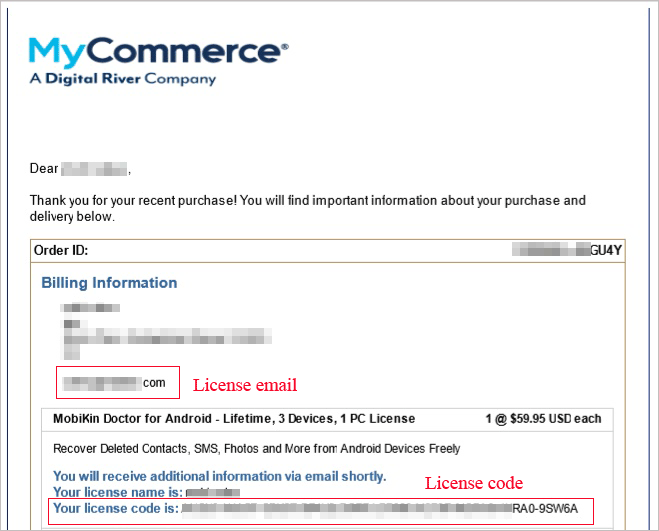 If you did not receive your license code within 30 minutes after the purchase or have questions related to billing or delivery, please contact the Order Customer Service Department of MyCommerce. How Long will I Receive the License Code after the Purchase? Tips: Please remember to backup your license code after receiving it.